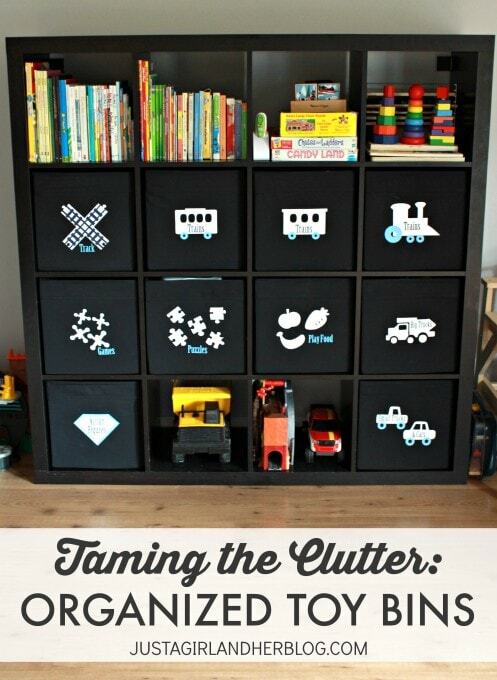 Five Things Friday: Let’s Get Organised 3 – Toy Storage | Keeps Me Out Of Mischief! In the last 30 months our house has gradually been taken over by brightly coloured plastic and battery operated noise and with another sprog on the way the problem is only going to get worse. Here’s some ideas to store all their treasured possessions! 1. I’m all for labeling so the kids can tidy their own things away. Just a Girl has these labeled bins for different toy types. 2. Shiny 2010 shares this idea on Weddings Online to use a hanging shoe storage rack for craft materials. 3. 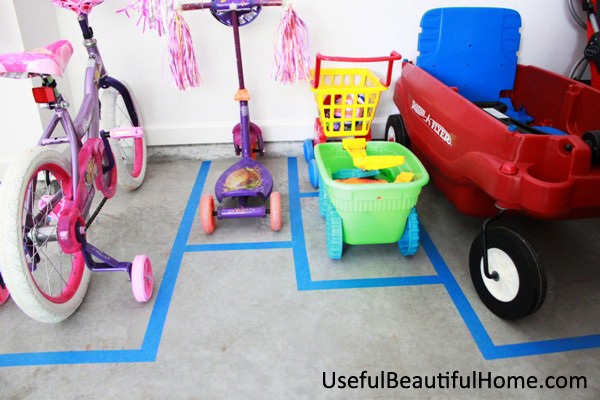 I’m an Organizing Junkie shares this idea for zoning a garage floor to keep the outdoor toys from ending up in a massive pile in the corner. 4. Bath toys drive me insane. We currently keep them in little B’s old tummy tub but with a new arrival we’ll need to use it again. This great idea from Our Four Walls uses a tension rod to organise everything. 5. Mums Make Lists uses these zippa bags to keep sets of toys together – definitely need these to keep the various sets together.